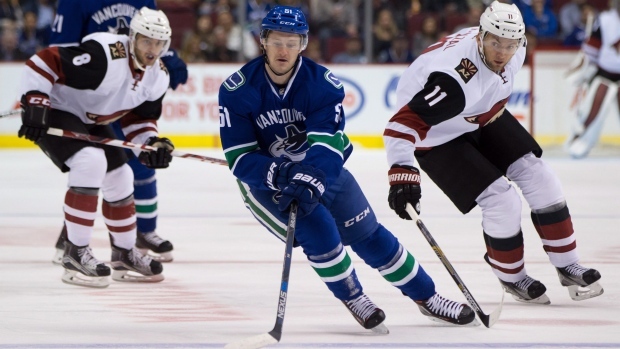 VANCOUVER - A return to the middle paid off for Jared McCann and the Vancouver Canucks. The 19-year-old scored on the power play in the third period and Jacob Markstrom stopped 32 shots as Vancouver shut out the Arizona Coyotes 1-0 in pre-season action on Monday night. Making a strong bid to stick with the Canucks, McCann took a pass along the boards and fired a low shot past Arizona goalie Mike Smith at 8:34 for his first goal and third point of the exhibition schedule. "It doesn't get any better than that," said McCann. "Game-winning goal, pretty exciting." A natural centre, McCann started the game on the wing with Brandon Sutter and Alexandre Burrows before moving down the lineup and back to his usual position after the first period. "It should do a lot for his confidence," said Canucks head coach Willie Desjardins. "It was a great shot and a great goal." McCann and fellow 2014 first-round pick Jake Virtanen, who played on a line with Daniel and Henrik Sedin, were given top-six forward roles for the game as the Canucks get long looks at both players with the regular season set to begin Oct. 7 against the Calgary Flames. "We have to have guys battling for jobs," said Desjardins. "If guys deserve it we have to get them in the lineup." Sutter said he has been impressed with McCann throughout training camp, as well as on Monday when he was asked to play out of position. "It's nerve wracking for a young kid when you're trying to make a team," said Sutter. "He's a pretty smart player and that's what helps him. He's really intelligent." The Coyotes had a power play to start the third and Markstrom — tabbed to be Vancouver's No. 2 goalie behind Ryan Miller after Eddie Lack was traded in the off-season — had to be sharp on Tobias Rieder's quick shot from the slot. "I felt good. The guys did a great job letting me see the pucks," said Markstrom. "I feel better and better every day." Canucks forward Adam Cracknell, who scored in overtime in Vancouver's first pre-season game, then saw his shot on a 2-on-1 stopped by Smith five minutes into the final period before McCann struck on the power play. McCann and Virtanen, who is also 19, are both too young to play in the AHL this season and would have to be returned to their junior teams if they don't make the Canucks' roster. Virtanen had the bigger impact early, delivering a hit on his first shift before taking a high-sticking penalty. "He played hard," said Desjardins. "It's a learning experience to play with (the Sedins)." Coyotes forward Martin Hanzal moved in on a breakaway early in the second, but Markstrom made a nice glove save, and Smith snagged a Sven Baertschi effort on a 2-on-1 at the other end five minutes later. "I thought we got outplayed badly in the second," said Desjardins. "They got on us, we were losing lots of faceoffs. They were just winning all the battles. "The McCann goal really got us going." Notes: Smith finished with 23 saves . ... The Canucks visit the San Jose Sharks on Tuesday, while the Coyotes travel to Edmonton to take on the Oilers. ... Vancouver assigned six players to the AHL's Utica Comets earlier Monday, including forwards Cole Cassels and Nicklas Jensen.